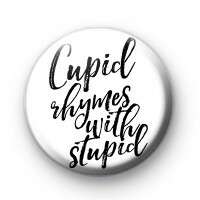 This is a 1 inch black & white pin badge with Cupid Rhymes With Cupid written in a hand written font. This is a great, funny Anti-Valentines Day badge. It a fun bade to wear on February 14th if you are not celebrating the day of love and want to poke a little fun at those who are. We lots of other really great Anti-Valentines designs in the shop so if you need a few more badges be sure to take a look at those too.